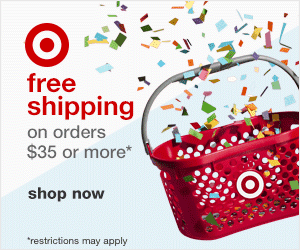 A few of my online card making friends have a challenge called Everything But The Kitchen Sink. It's super fun! Once a month, they have a challenge using a household item. And then the other half of the month, they offer a sketch challenge based on something within the home. This is a card I made for the current challenge. It's a sketch based on my pal Kelley's craft room. It's a super clean sketch and I took it pretty literally. 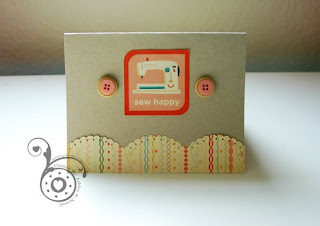 She has a sewing machine and buttons in her picture and I have them on my card. The sticker and DP are from Cosmo Cricket's Material Girl. The buttons are Papertrey Ink. Now, I have a bit of an issue with these buttons. Half the ones I got in my sampler say "Nike Golf" on them. Ummm, yeah, not so much the vintage buttons I was hoping for. So, what I did here was layer buttons on top of each other to cover the words. Also, the top buttons are turned backwards so that the logo doesn't show. This is just to adorable. Love the colors and that sewing machine is so cute. Oh this is great Ashley!! I love it! Just my kind of card... CAS and on Kraft.. ha! :) Thanks for playing along! Lol I got one of those Nike ones too. Cute card. Love it! Very clever disguising the buttons! Oh my I totally love this Ashley! Thanks for playing!